Holyhead , (Welsh, Caer Gybi, fort of Gybi), a parliamentary borough, market town, and seaport of N. Wales, on a small island of the same name at the W. extremity of the county of Anglesea, 67 m. W. of Liverpool; pop. in 1871, 6,193. An embankment three fourths of a mile in length, 16 ft. high, with a bridge midway, under which the tide rushes with great violence, connects the island across a sandy shallow with the island of Anglesea. The island of Holyhead is mostly a barren rock, ending in a huge headland of serpentine, and is noted for its magnificent caverns excavated by the sea. The town is irregularly built, but the houses are massively constructed of stone. A harbor of refuge has been formed by a north breakwater 7,860 ft. long and an east breakwater 2,000 ft. long, the completion and formal opening of which, after 25 years' labor, was celebrated Aug. 23, 1873. The north breakwater is terminated by a head on which is erected a lighthouse. The harbor and roadstead cover about 667 acres. The foundation of the work is a great mound of rubble stone, 400 ft. wide at the base, and nowhere less than 250 ft. in width at low-water level. It contains altogether about 7,000,000 tons of stone. The superstructure is a solid central wall of masonry built of stone from the Holyhead mountain quarries. The inhabitants are mostly engaged in rope making, ship building, and the coasting trade. The parish church is an ancient structure, dedicated to St. Gybi, with some rude but curious carving on its walls, and situated in a churchyard surrounded by a stone fence which appears to have been a Roman fortress. Holyhead is a terminus of the Chester and Holyhead railway. 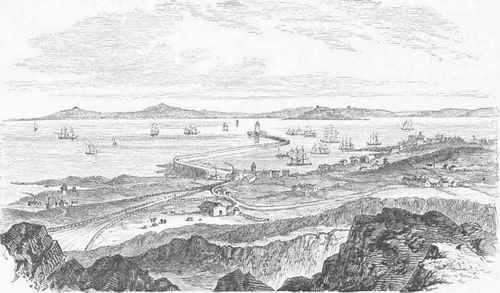 A submarine telegraph extends across the channel from Holyhead to Howth, and on account of its advantageous situation Holyhead has been made the principal station of the post-office packets to Dublin. New Harbor of Refuge at Holyhead.